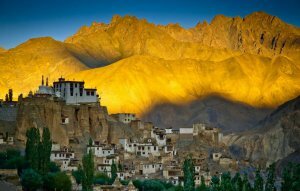 The Ladakh popularly know as the land of lamas or the coldest desert in the world is a high altitude tourist destination of Jammu and Kashmir state India. Ladakh region is around 3000 meters above sea level and consists of important mountain passes. Ladakh, therefore becomes an important trade route connecting Europe and Northern Asia to South-East Asia. Ladakh is of prime importance to the armed forces as it gives access to almost entire Himalayan region. 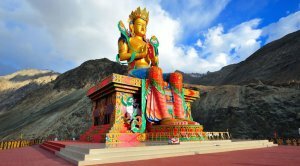 From a tourist’s point of view, Ladakh tours offers irresistible sights and places of attraction. The Leh and Kargil valleys provide unlimited photographic moments, which would act as perfect souvenirs of the trip to Jammu and Kashmir. 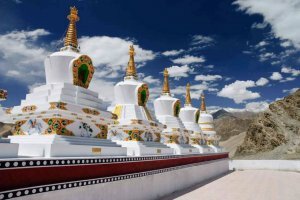 Online Holidays best ladakh tour operator for leh ladakh holiday packages offers Cheapest Leh Ladakh Tour Packages, Taxi Services, Camp booking, Inner Line Permit, Monasteries tour , Srinagar to Leh sharing taxi service. Ladakh is regarded as one of the highest ranked, travel destinations for the youth. Motor bikers love the drive from Kashmir or Manali to Ladakh, which is one of the most scenic journeys one can choose to embark upon. Regarded as a mysterious moon-land of journeys, the travel to Ladakh is especially alluring as it is not for the faint-hearted and low-spirited. Ladakh in India is where people go to find themselves as they embark on a search of adventure. Tucked in the rough hilly valleys, 3000 meters above sea-level and situated remarkably between the Himalayan and the Karakoram Range, Ladakh offers the best panoramic views of snow-peaked mountain tops. If one were to pinpoint one road-trip of a lifetime for the youngsters visiting in India, it would definitely have to be to Ladakh. The stunning valleys, the hair-pin bending roads up hill, the breath-taking views of vastness, the life of natives in the bosom of mighty mountains and the unique golden rays of sunsets atop 3,000 meters, all of these make up for a uniquely, unforgettable trip to a special land. However, travelers must know that Ladakh in all of its glory is not always accessible for visits. The highways that lead to Ladakh remain open from May to October only. The rest of the months have them covered in thick snow, impenetrable. Nevertheless, the drive from Manali or Srinagar to Leh in Ladakh is considered as the most scenic trips and stands out to be a significant trip that you can ever set out upon and is highly recommended. 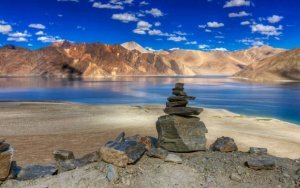 how you can reach Ladakh and make the most of the journey? The closest airport is at Leh, called the Leh Kushok Bakula Rimpochee Airport; it is well connected to Srinagar, Jammu and Delhi. You can easily avail quality flights from Go Air, Air India and Jet Airways. Regular flights from Delhi, Chandigarh and other cities ply to and fro to this airport. Cabs are abundantly available outside the airport and can take you to your place of accommodation, which are also a plenty in Leh. An important tip to consider when planning traveling by air is that although schedules are set, flights are often delayed due to the harsh weathers. So, it is advised that you keep your plans flexible. Noteworthy to be mentioned, the Leh Airport is a military air terminal, which is why security checks are often a little more stringent than the usual air terminals. It would be better if one can convey a printed copy of their air ticket before entering; failing to do so often causes denials to section. Indian airlines offer 3 flights in 7 days between Delhi and Leh and 2 from Jammu with 1 from Srinagar, once in 7 days. Jet airways is known to offer 6 flights in 7 days from Delhi to Leh. Go Air works day-by-day offering flights to and fro Delhi to Leh. The approximate cost flights from Delhi to Leh are about INR 8,000. The closest railhead from Ladakh is at Jammu Tawi which is around 700 km from Ladakh. It is well-connected through trains from Delhi, Kolkata and Mumbai and several major cities. From the railway station one can board a bus from the JKSRTC to Ladakh or hire a private car or taxi. Two other rail stations near Ladakh are Chandigarh and Pathankot, which are both roughly 3-days travel ride away. A taxi ride from Jammu Tawi station to Leh will cost around INR 12,000/- and will take 2 days of journey. This is usually the least preferred mode of transportation to Leh. 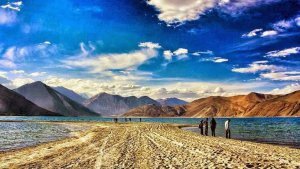 You can reach Ladakh from the Kashmir Valley on-road through one of the most scenic road-trips coming via the historic land of Kargil, which is around 434 kms. The route remains accessible from early June to November. The iconic Zoji-La pass of the Himalayan ranges is the gateway to Ladakh, situated approximately at 11,500 feet which is 3,505 m above sea-level. J & K State Transport Corporation offers regular buses, both ordinary and deluxe ones for travelers, between Srinagar and Leh. A night’s stay at Kargil may be required; people also hire jeeps or taxis that available from Srinagar. Deluxe buses and other large vehicles for those travelling in groups are also available in Leh, Kargil or Padum. By road access to Ladakh is only available to people during the months of May to September, as other months have the road covered in snow. The long, well-built, traffic-devoid streets leading to Ladakh is by far the most alluring drive for anyone who enjoys the road and the art of driving. The Manali to Leh road is of 473 kms, it has been accessible to people since 1989 and is another tempting drive to Ladakh. The route is open from mid of June to early October. The road travels through some picturesque spots like the desert plateau of Rupsho and is about 4,570 m above sea-level. There are a handful of high passes in this route with the iconic Taglang-La, being the second highest motorable road in the world! It is situated at 17,469 feet above sea level. Buses from Himachal Pradesh Tourism Corporation are also available for people traveling from Manali. It usually takes 2 days to reach Ladakh with a night stay at camps in Sarchu or Pang. Jeep taxis and gypsies also form a good option. While the travel might seem daunting, it is an experience that is worth every bit of the effort and money you spent to reach the Leh valley. It is hands down one of the best adventures you will ever embark upon and the scenic beauty of the journey will remain unmatched like none other! So, go on and hit the road!